Max Planck Innovation, the technology transfer organization of the Max Planck Society has licensed a new method for processing digital stereo image content to TandemLaunch Technologies, a Canada based company, which develops multimedia inventions into consumer technologies. The new "backward-compatible stereo 3-D" technology makes it possible to watch movies in 3-D, when wearing glasses, and 2-D without glasses at the same time. 3D technology is increasingly used in computer graphics and is a major trend in the entertainment and consumer electronics industry. Today, a large number of movies are either shot in or shown as virtual reality movies based on 3D technology. Most private users, however, have not yet adopted the new technology at home for a number of reasons. The stereo impression can only be enjoyed with anaglyph or shutter glasses. Without glasses, spectators can only see a blur of two images. Also many people do not like to wear glasses in front of their television. Moreover, a many people suffer from discomfort or headaches when watching 3D movies with glasses. A joint invention from scientists of the Max Planck Institute for Informatics, the Computer Science department at Saarland University and Telecom ParisTech now brings a solution. 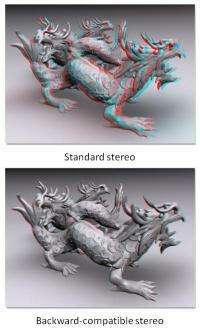 The innovative technology named "Backward-compatible Stereo 3D" provides a method and a device for processing digital stereo image content predicting the perceived disparity from stereo images. This makes it possible to get high-quality 3D impressions when wearing glasses and high quality 2D impressions without seeing so called artifacts without glasses when sharing a screen. For the development of the new technology it was crucial for the inventors to understand the human visual system and how it perceives 3D images. To estimate spatial configurations, the human visual system (HVS) relies on a large variety of depth cues. Binocular disparity is one important cue: An object observed from slightly different angles by the two eyes. That way a specific point in the room is being reproduced on the retina of each eye at two different positions. The researchers found out how the HVS reacts to stereoscopic images and how sensitive it is to changes in binocular disparity in conjunction with other depth cues. As a result the connection between real and perceived disparity could be explained and the perception of stereoscopic pictures with regard to three-dimensionality could be predicted. Also the scientists found out that there are certain thresholds limiting human perception. Below these thresholds the disparity has no effect on the visual impression. Based on these findings and utilizing the so-called Cornsweet illusion for disparity, the scientists were now able to rescale stereoscopic pictures in such a manner that only the minimum required disparity remained. That way the scientists succeeded in creating a backward-compatible stereo picture that allows for 3D impression and minimizes the artifacts when not wearing glasses. TandemLaunch has licensed the invention and is about to develop it into a product. "Backward-compatible Stereo 3D will allow us to produce content that appears ordinary to a viewer without stereo equipment and conveys 3D impression when such equipment is used. The technology will change television as we know it", says Dr. Helge Seetzen, CEO of TandemLaunch Technologies. Dr. Bernd Ctortecka, Licensing Manager at Max Planck innovation: "We are glad to have identified a partner such as TandemLaunch which has the capability of transferring a promising early-stage technology into a market ready product, which can then be applied by industry." Axel Koch, Head of Patent Marketing Agency of Saarland Universities adds: "We wish there were more companies like TandemLaunch Technologies which bridge the gap between academic research and industrial needs and we believe that TandemLaunch Technologies is the perfect partner for this outstanding innovation."